We have a simple mission at Proof Brewing Company. Create a business the community is proud of and believes in. This is achieved through producing world class beer, creating quality jobs that generate a stronger local economy, and lifetime customer experiences. We are approaching our third move and expansion, and continuing to reinvest in our community at 1320 South Monroe Street. This investment will result in creating an estimated 20 new jobs over the next two years, a few of which have already been filled. An investment we believe in! For Proof, when it comes to brewing—growth equals greater quality. One of the highlights of our new facility is the addition of laboratory infrastructure. We are investing in lab equipment, technology, and efficiency for quality control and quality analysis. This will expand our brewing process to enhance consistency and stability through repeatability. We have acquired larger tanks to grow our fermentation capacity. The largest tank will be 100 barrels, or 24,800 beers! The facility is uniquely designed for continued expansion and investment. As demand increases, we can add additional fermenters and acquire a larger brewhouse. We are committed to producing a higher quality product then we have ever achieved! The beloved beer garden and tasting room, will continue at our new facility but with a larger, improved atmosphere. Each element has been hand designed by owners Byron and Angela Burroughs with careful thought and meticulous process. One addition to the main tasting room, will be a full-service bar providing cocktails in addition to beer. The outdoor beer garden will feature an all-weather covered patio area with seating and projection, including built in gas heaters and fans. The new facility will also feature an on-site restaurant called Proper. Food will be available during tasting room hours ranging from tasty small bites to delicious plates. Finally, Proof will also feature a beautiful event space for rentals with its own private bar and private beer garden. We are so excited to announce our grand opening within the next couple weeks. We currently have a projected opening of late January. 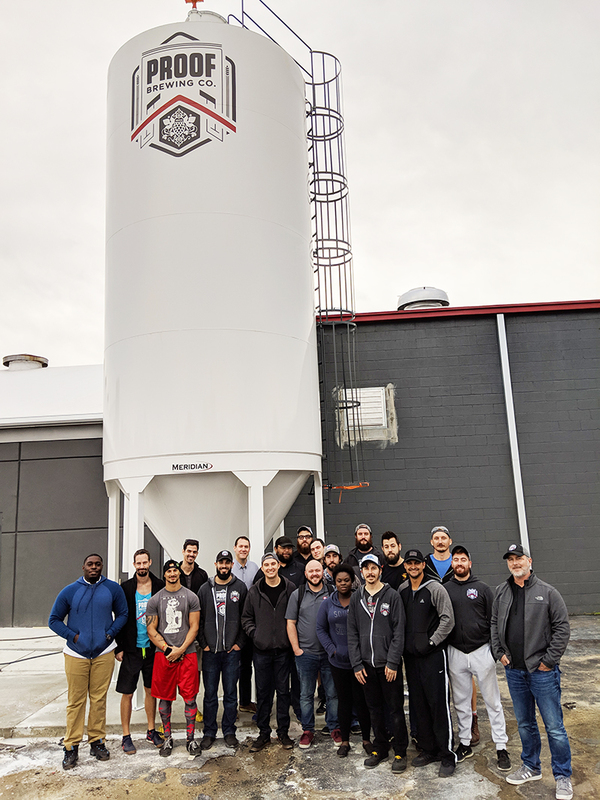 The team at Proof Brewing is devoted to our community and continuing to reinvest. The future is bright for Tallahassee and we can’t wait to share our dream with you in our new forever home.